Among them are 23 Full HD 3D sets. The wait is over for Sony's new line of Bravia sets. A total of 37 new models are shipping to retailers now. A significant number of those are Full HD 3D sets and even more are capable of streaming from online sources. 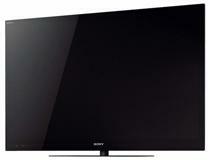 At the top of the line is Sony's XBR-HX929 series, which comes in 46 inch ($2,999), 55 inch ($3,799) and 65 inch screen sizes. They boast Full HD 3D, LED backlighting, Corning Gorilla Glass and Wi-Fi that lets you access Bravia Internet Video. Price is yet to be announced on the 65 inch set. The cheapest of Sony's 3D sets is the KDL-EX720, which starts at $999 for the 32 inch model and goes up to $2,399 for 55 inches. It offers Wi-Fi, Motionflow XR240, and come Skype ready. Sony's EX520 starts at $699 for the 32 inch model and packs a Full HD display, Wi-Fi, a presence sensor and the ability to access Bravia Internet Video.